New Delhi, India -- Exactly 1,000 year ago, Atisa, who is widely recognised by scholars as a cornerstone of the development of Tibetan Buddhism, visited Indonesia. The mutual sharing of knowledge and the meeting of Indian and Indonesian traditions of Buddhist philosophy makes this one of the great events in the history of Buddhism by many. Celebrating this common thread and commemorating his historic visit, a two-day event ‘1,000 Years of Atisa’s Visit to Indonesia’ was organised at India International Centre (IIC), Lodhi Road , with cham dances by monks of key monasteries, Spiti; screening of films on Buddha and Buddhism directed by Benoy K Behl; ‘Indo-Japanese Photographic Exhibition’ and a seminar on Vajrayana Buddhism. Besides, there were lectures in which select Indian and Tibetan scholars and one each from the USA, UK and Bangladesh spoke about Tibetan Buddhism, cham dances, charya dances of Nepal and about Atisa. Geshe Damdul, Director of Tibet House made a presentation about the importance of Atisa’s teachings in the Buddhist tradition. Also known as Dipankara Srijnana, Atisa (980-1054) was born in East Bengal, studied at Nalanda University and then became one of the leading teachers at the University of Vikramshila, also in Bihar. He was invited repeatedly to Tibet by King Yeshe ’Od and eventually he accepted his invitation at the age of 60. 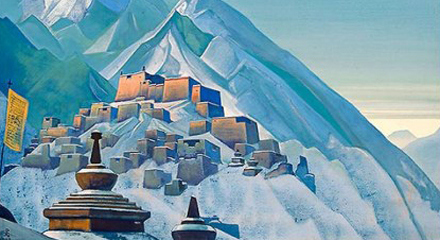 He left Vikramshila and stayed in Tibet until his death. He consolidated the true knowledge of Buddhism in that land. “The event aimed at celebrating the marvelous exchange of knowledge of Buddhism which took place when Atisa visited Indonesia 1,000 years ago. This would go a long way to strengthen India’s Buddhist ties with the countries of Asia,” said Benoy, whose 12 films on the subject of ‘The Story of Buddhism’ were screened during the event. The films show the birth and the development of Buddhism in India and its spread to the Asian countries. One of the films is about the Buddhist heritage of India-ASEAN. “It highlighted the contribution of Vikramshila and Nalanda to the development of Buddhism. Secondly, it will consolidate cultural connections with Indonesia and other Asian countries. It will give a true perspective about the Indian contribution to all forms of Buddhism in Asia,” he added. What won the hearts of one and all were cham dances by masked monks. It is performed to invoke gods and goddesses. According to the beliefs, witnessing cham helps in overcoming all obstacles. About 79 photographs clicked by Benoy and a Japanese photographer Eiichi Matsumoto provide an insight into the Buddhist heritage of the world. The exhibition includes photos taken by Benoy across India and 18 other countries where the religion is spread including Russia, Lhasa, Bhutan, Nepal, Indonesia, Bangladesh, Sri Lanka, Uzbekistan, Mongolia and more. The photographs provide a wide perspective of the ancient monuments and art heritage of Buddhism across Asia – from India to Japan. Some of the interesting shots include people of Kaimykia receiving blessings of a Ladakhi lama in Russia; lamas of Ladakh performing cham dance; The Bamiyan site in Afghanistan; interior of Mogao Cave no. 45 at Dunhuang in China; and Phugtal Monastery in Ladakh, which is in a very remote part of the region.